Love this image by Cuban artist Sandra Ramos. 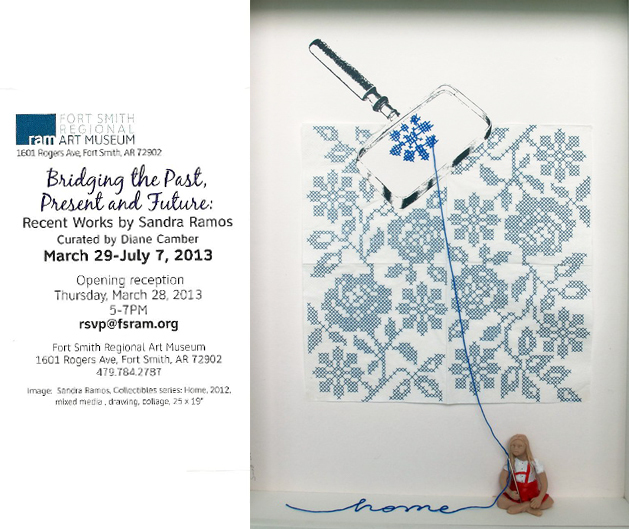 Her next mixed media exhibition starts tomorrow in Fort Smith. 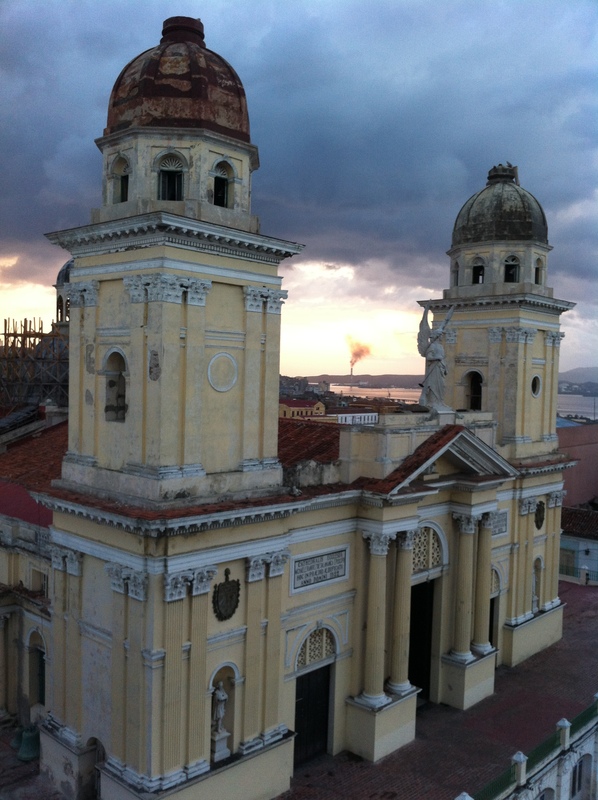 Requiem for the greenery: Santiago de Cuba after Hurricane Sandy. It was a shock to return to Santiago earlier this year post Hurricane Sandy; the city has been denuded. The cathedral has lost its twin crosses and much of the roof is under renovation. 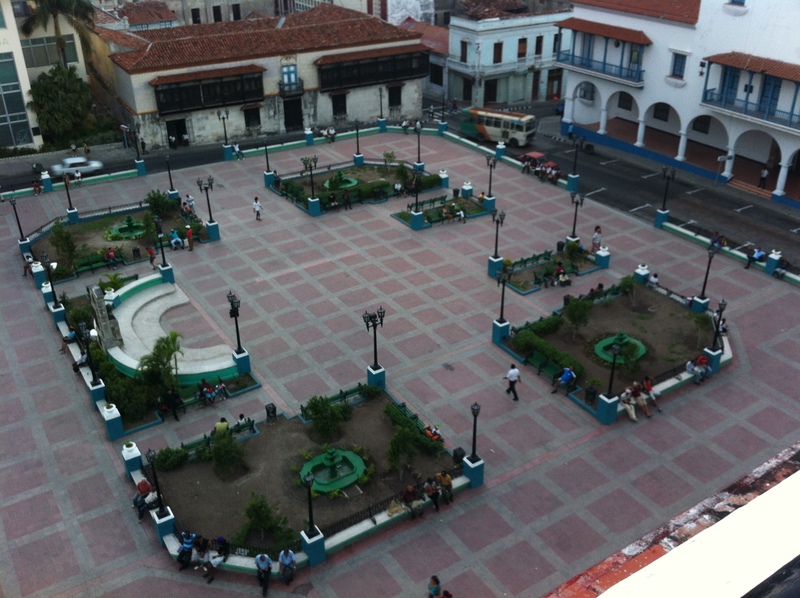 Parque Céspedes looks extremely forlorn without its trees and its much sought after shade. Up the road, Plaza Marte has been shorn of nearly all of its trees and palms. Whole vistas of the mountains have opened up everywhere you walk in the city where previously plump, leafy trees had obscured the views. Inspectors were travelling house to house asking if people still needed repair materials, and new licks of tarmac had unfurled along whole roads in the historic centre. The human cost and the roofing disasters are still all in evidence. The absence of greenery is shocking and will take years to rejuvenate. Like Ho Chi Minh of Vietnam, Chávez’ burial wish is about to be ignored. The Vietnamese have made the mausoleum housing Ho Chi Minh’s body a holy place of pilgrimage and visitors march in file to see Ho’s embalmed corpse inside the mausoleum (Lang Chu Tich Ho Chi Minh). The embalming and eternal display of Ho Chi Minh’s body was contrary to Ho’s own wishes: he wanted to be cremated and his ashes placed in three urns to be positioned atop three unmarked hills in the north, centre and south of the country. He once wrote that “cremation is not only good from the point of view of hygiene, but it also saves farmland”. The embalming of Ho’s body was undertaken by the chief Soviet embalmer, Dr Sergei Debrov, who also pickled such Communist luminaries as Klenient Gottwald (President of Czechoslovakia), Georgi Dimitrov (Prime Minister of Bulgaria) and Forbes Burnham (President of Guyana). Debrov was flown to Hanoi from Moscow as Ho lay dying, bringing with him two transport planes packed with air conditioners (to keep the corpse cool) and other equipment. To escape US bombing, the team moved Ho to a cave, taking a full year to complete the embalming process. Russian scientists still check-up on their handiwork, servicing Ho’s body regularly. Their embalming methods and the fluids they use are still a closely guarded secret. In an interview, Debrov noted with pleasure the poor state of China’s Chairman Mao’s body, which was embalmed without Soviet help. The mausoleum, built between 1973 and 1975, is a massive, square and forbidding structure and must be among the best constructed, maintained and air-conditioned buildings in Vietnam. Opened in 1975, it is modelled closely on Lenin’s Mausoleum in Moscow. Ho lies with a guard at each corner of his bier and visitors march past in file to see his body.